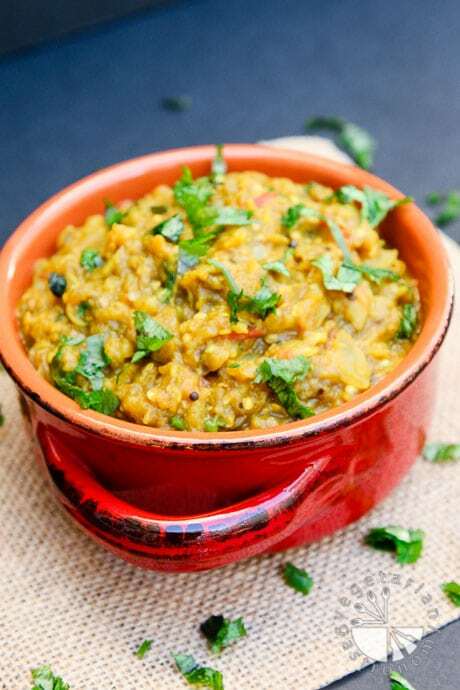 Meet one of my favorite Indian Dishes…Roasted Smoked Eggplant Curry, otherwise popularly known as Baingan Bharta. My mom rarely made this dish growing up, so it really wasn’t until college, when one of my roommates made it, that I had my first real experience with this dish. I had seen it at Indian restaurants before, but had never bothered trying it. So when I realized how easy and unbelievably tasty it was, it quickly became a favorite of mine. I’ve now created my own version of this dish. 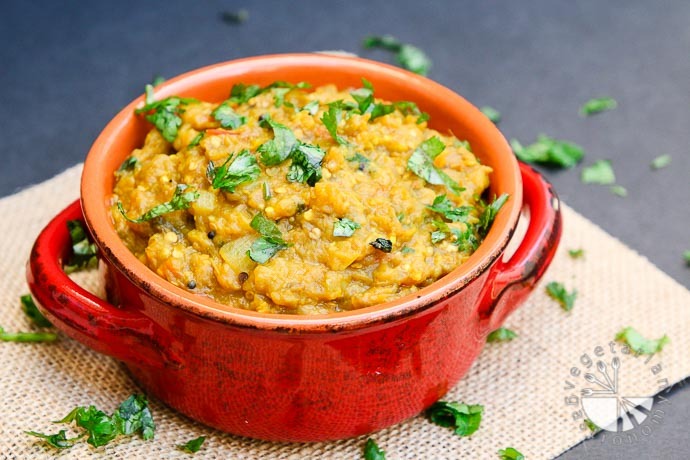 If you’re not familiar with this traditional Indian dish, you can think of it as an Indian version of Baba Ghanoush. 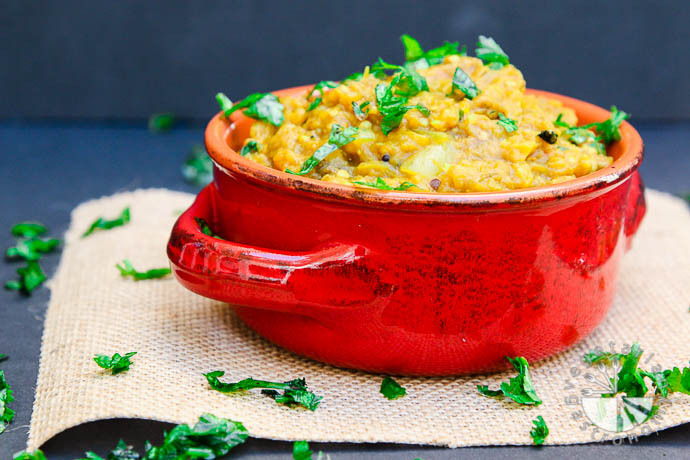 The meat of the eggplant, after it has been smoked and roasted, is pureed/mashed with a lot of tomatoes, garlic, onions, herbs, and spices to create a delicious creamy Eggplant Curry. 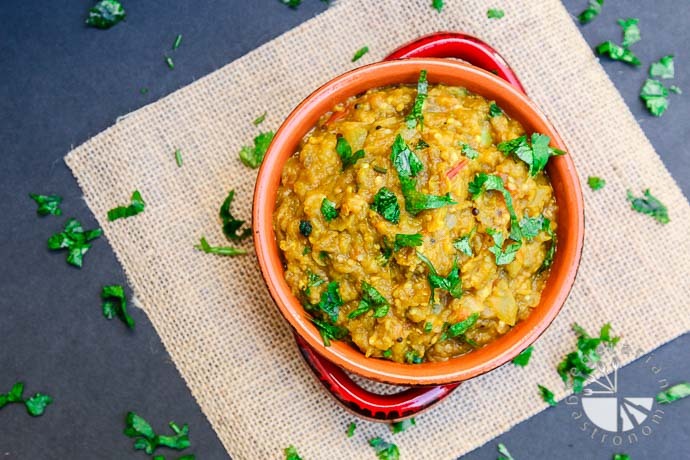 You can enjoy it with some home-made whole wheat tortilla, Naan, rice, or serve it with pita chips and use it as a hot or cold dip. 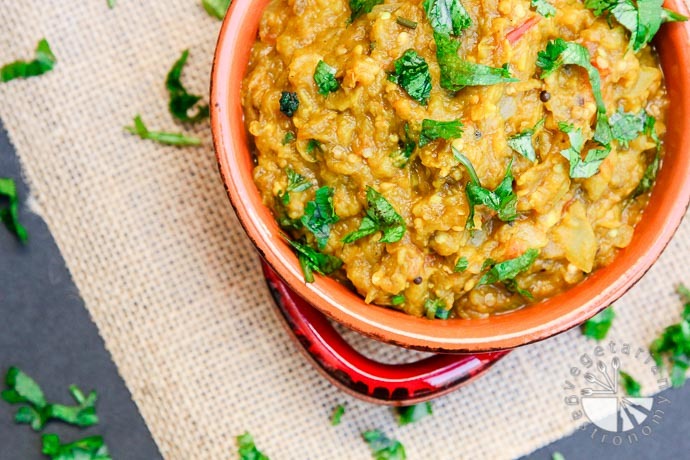 Smoky, roasted eggplant is combined with spices, tomatoes, and fresh herbs to bring you this delicious family favorite curry! Prick the outside of each eggplant a few times all the way around (I used a skewer). Char the outside skin of each eggplant by placing them directly on the open flame of a gas burner. After 2-3 minutes or as the outside skin starts to char, rotate the eggplant so that it is evenly charred on all sides. Alternatively you can grill or roast the eggplant alone, but then you will NOT get the smokey flavor of the eggplant. Place the smoked eggplants on a lined baking sheet (I used a silpat ) and place in the oven to roast for 20-30 minutes, or until they are completely soft. When they are done, you should easily be able to pierce a knife or poke a metal skewer into the core of the eggplant without any resistance. Remove the eggplant from the oven and allow it to cool. Split the eggplants in half lengthwise and scoop out the meat. Or simply peel the outer skin of the eggplant so that you are left with the inside meat. Discard the outer skin. Place the meat of the eggplant into any blender (such as a vitamix). Pulse to chop/mash or roughly puree the eggplant. 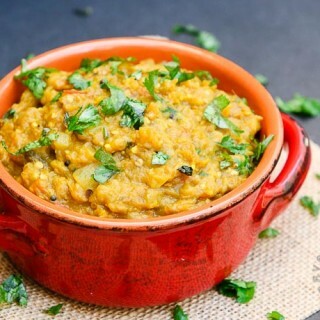 Note - I prefer to roughly puree the eggplant to have more of a smooth creamy texture, but I've also simply chopped and mashed the eggplant down with a masher or fork (instead of using a blender) and it tastes great either way, just depends on your preference. In a non-stick pan, heat the cooking oil on medium heat. Add the black mustard seeds and asafetida (if using). Cook just until the seeds start to fry. Add the finely chopped garlic, minced ginger, and minced fresh jalapenos (if using). Cook, mixing frequently, for ~30 seconds until fragrant. Be sure that the contents do not stick to the pan. If this happens, simply lower the heat or add more oil. Add the chopped onions and saute until the onions start to become translucent, mixing frequently. 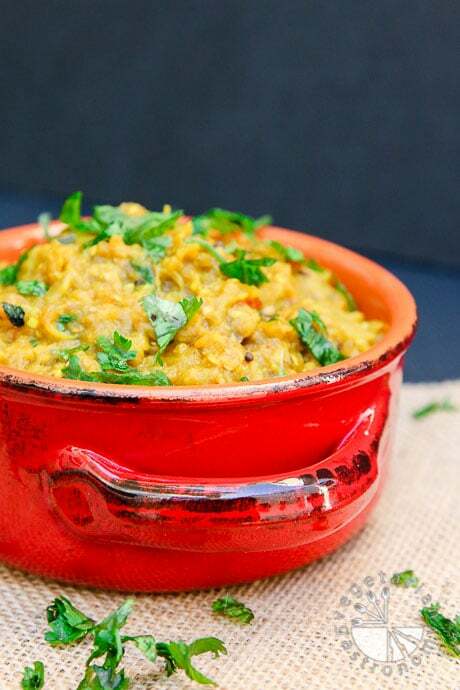 Add the chopped tomatoes, turmeric, coriander powder, cumin powder, garam masala, fresh lemon juice, and salt. Combine and saute until the tomatoes and spices start to cook in (a few minutes). Add the roughly pureed or mashed eggplant. Combine and mix well with the tomato-onion mixture for 1-2 minutes. Taste and adjust the amount of salt or lemon juice if necessary. Saute for another 3-4 minutes, mixing frequently. Add the freshly chopped cilantro. Turn off the heat and serve hot with you favorite whole wheat tortilla (home-made or store-bought), Naan, or rice. Enjoy! Asafetida - Most brands combine asafetida with wheat. So omit for gluten-free option unless you are sure it is certified gluten-free. Eggplant - If you do not have an open flame to smoke the eggplant, you can skip smoking the outer skin and simply roast in the oven. You will not get that smokey flavor, but the dish will still turn out delicious! Hi Anjali. I love the smoked flavor of the eggplants! I learnt from my mother-in-law to add a teaspoon of ground peanuts and just a little tamarind paste toward the end. The smoked flavor makes this dish awesome! Those sound like great additions to the dish, and I have both on hand! I'm making this again next week so I'll try it with your suggestions! Thank you! I would say it's about 4 servings. Sorry...i'm in the process of updating all the recipes and including serving amounts. How would you char it with an electric stove? That'd be difficult...I don't think you can. Instead you can easily just roast it in the oven and it'd taste just as delicious! Just perhaps may have less of a smoky taste but still REALLY good. I've done that before as well. My family doesn't like eggplants that much but with your recipe we like it.test good. Thanks for trying it out! That's soo odd that it took that long to cook the eggplant...shouldn't be the case at all especially if you prepped it properly. Hmm...yeah maybe oven temperature. I typically use the pretty large italian eggplants when i can't find the smaller ones so size shouldn't be an issue. Plus, eggplant should cook quicker then that in the oven. Well glad you enjoyed it! This is definitely loved based on taste buds...if you're not used to the flavor profile, your kids may not. mine love it, but we're used to all those indian flavors :) Thanks so much for the review and trying it out!